When I first moved to NYC in November of last year, I was absolutely clueless heading into the winter abyss. I came without a winter coat, high socks, gloves, or even an umbrella. Long story short, I was not remotely prepared. After living in Los Angeles for basically my whole life, I needed a little bit of guidance on how to deal with this whole weather thing. Luckily, the lovely Nicole Eshaghpour and Lauren Eggertsen, Who What Wear's editors in New York, were so helpful to me during my time of need. 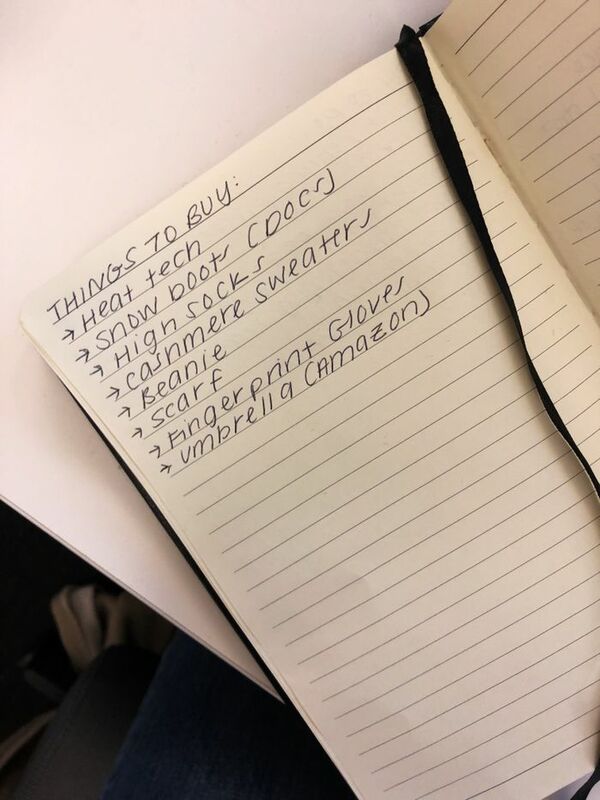 They gave me a list of things to buy to survive cold weather, and it was so helpful for me that I'm sharing it with you. I even included a photo of the list below because I still reference it to this day. I truly would not be surviving winter if not for these eight things, and although (hopefully) the cold weather will subside soon, the hard truth is that we've still got a bit of winter left to go. It's not too late to invest in these winter pieces, and I promise you will not regret it. If you're unfamiliar with Uniqlo's Heattech technology, then you're in for a real treat. First of all, it actually works, and secondly, it's pretty stylish. The innovative clothing technology keeps you warm and is truly the perfect cold-weather option. Plus, it's incredibly affordable. Believe it or not, I never owned a pair of real boots before moving to NYC, and my snow boots were truly my greatest purchase. Lucky for me, chunky boots are in this season, so they're both on trend and practical. Swapping my no-shows for high socks is the smallest change I've made to my wardrobe, but it has had the biggest impact. I learned very quickly that exposed ankles were not going to cut it in the cold and switched over to high socks. It's made all the difference. This one is pretty self-explanatory. Cashmere is warm, luxe, and comfortable, making it the perfect piece for winter. I can safely say I never wore beanies before moving to New York. I'm not a big hat person, but a good beanie is vital to surviving a cold winter. Very key to warmth, a scarf can also add an extra dimension to any outfit. It's the perfect cold-weather accessory that also has great utility. The importance of gloves cannot be overstated, and these days, they make special gloves to make sure you can still use your phone. This one might seem obvious, but an umbrella is a key part of surviving winter. I've already lost about four of them, but investing in a good umbrella and trying not to lose it is next on my list. Up next, 11 pieces I bought because my rather stylish co-workers own them.